Halos tonight at Dinner with Dave! head to Memphis at the Santora tonight for some free food, live music, excellent drinks, and a good dose of mid-week fun at Dinner with Dave! sign into Facebook to view the public event -here-. sooo exciting to see Explosions in the Sky as a free download from Urban Outfitters today! 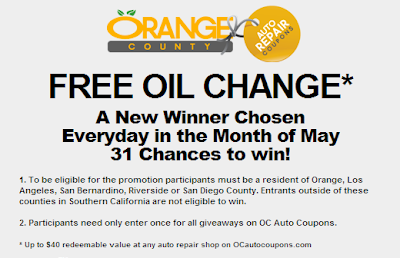 31 Chances to Win a Free Oil Change from OC Auto Coupons! OC Auto Coupons' 31 free oil changes giveaway is almost here! every day in May, OC Auto Coupons will be giving away a free oil change redeemable for up to $40 at any of the highly rated auto repair shops listed on OCAutoCoupons.com! before 10am, May 1st for 31 chances to win! you'll be notified if you win and get a monthly email with future giveaway info and discounts. OC Auto Coupons connects consumers with big discounts at local shops! Last Day of Fulerton City-Wide Egg Hunt! the Fullerton Egg Hunt for adults ends today, Easter Sunday! the Fullerton Chamber of Commerce has hidden over 40 eggs throughout the city. many have been found but a few are still left to be recovered! altogether the eggs are stuffed with more than $1,000 in prizes. the grand prize egg is still left to be found! 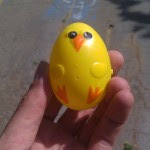 updates on the egg hunt can be found at insidefullerton.com and the inside fullerton twitter page! Win a Free Oil Change from OCAutoCoupons.com! 31 chances to win! with gas prices forever on the rise, OC Auto Coupons' 31 free oil changes giveaway couldn't have come sooner! to find the official rules and fill out the Special Offer form to enter! you will get an email message if you win. you'll also get a once a month notification with info on the next giveaway. each free oil change is redeemable for up to $40 at any of the highly rated auto repair shop listed on OCAutoCoupons.com! before 10am on May 1st for 31 chances to win! while you're waiting for the giveaway to begin, check out OCAutoCoupons.com to find discounts at Orange County's top auto repair shops. you will be supporting local businesses while getting a deal and fixing up that precious car! Kohl's One-Day 50% off Sale! today is Kohl's One Day Only 50% off sale!! Prices are only good for today, Wednesday, April 20th online and in-store! click -here- to view the deals and take part in the shopping extravaganza! happy free music monday from Urban Outfitters! Robbins Brothers of Fullerton Gift Card Giveaway! Robbins Brothers offers beautiful designer wedding rings to those in love, everyone knows that. but what you may not know is that tonight you have the chance to win some free moola from Robbins Brothers towards buying that perfect ring! so, how do you get that gift card? hit up Chuck Wagon Stop outside of Robbin Brothers in Fullerton tonight from 5-9, snap a picture of yourself in front of the Robbins Brothers' store, and tweet the photo to @RobbinsBrothers to get your chance to win a gift card redeemable at the Fullerton store! get all the details on the Robbins Brothers' blog -here-. free music monday from Urban Outfitters! 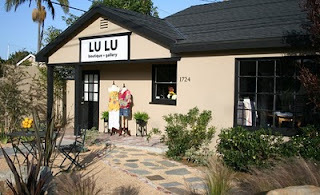 LU LU's events are always super luxe and fun... AND you can really nab a great deal! 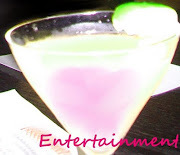 on thursday, april 7th from 5-7pm, be sure to visit LU LU for Girl's Night Out! Music Monday from Urban Outfitters. here are your free tunes! Refinery29 is a great resource for the fashion-minded (typically those with some decent moola to spare) but they also publish articles on inexpensive products to make you feel like a million dollars. their recent article, 10 Cheap Skincare Thrills Under $10, is really great! 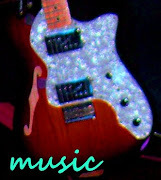 check it out by clicking -here-. 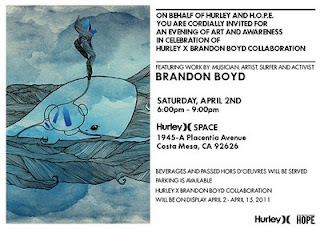 Hurley X Brandon Boyd Event Sat, April 2nd! We all know that Brandon Boyd of Incubus is super talented however i was somehow surprised to learn that he is a really phenomenal (fine) artist! Brandon Boyd's art is coming to town and on display April 2nd at Hurley X Space in Costa Mesa! this event is hosted by Hurley and H.O.P.E. expect beverages, hors d'oeuvres, and lots o' art!